Here at Children’s Ark Academy, we’re proud to be a Christian preschool. We believe that it’s always a good idea to bring kids up in as Godly an environment as possible, and the Christian daycare we offer goes a long way to that end. It’s there everywhere you look, from our website to our walls to the friendly greetings you get from the administrators. How Instructors Show It: Love is at the core of Christianity, and we’re sure to show it to kids every day. We show it with our kind words, appropriate hugs, telling them about Jesus, and by employing the rest of the Fruits of the Spirit throughout the day. How Kids Show It: Kids are full of love, and we encourage them to show it unconditionally to teachers and the other kids in the class. Sometimes they have to be reminded about how important it is to love others around them, but a gentle guiding usually gets them back on track. Love is about not asking anything in return when you do something for someone, loving them no matter what. How Instructors Show It: Joy is certainly one of the easiest Fruits of the Spirit, because working with kids is so fun! Even when we’re having a not-so-perfect day in our personal lives, it’s very easy to give oneself over to the kids and the joy of learning they are experiencing. Of course, that joy goes beyond simple happiness that we experience throughout the day. It also means the joy of knowing God’s love and the joy of teaching kids about it. How Kids Show It: On the surface, kids’ emotions can be all over the place during any given day. Some kids are more prone to constant happiness, others are a bit more reserved in showing their feelings. But as long as they have the joy of the Lord in their hearts, which we try to foster every day, there’s always a light in their eyes. How Instructors Show It: Teaching kids about God can be a great way to get away from the craziness in the world around us. There might be personal or political strife before and after preschool, but when we’re there with the kids we have the peace of having the most important resource in the world in front of us — young minds eager to learn about God, reading, writing, math, and science. It’s a peaceful feeling knowing what’s expected of us throughout the day as we help kids grow. How Kids Show It: First of all, there’s the peace of the mind and body that kids will experience: there are nap times and quiet times, which kids desperately need to revitalize their growing bodies and minds. There’s also the peace that comes with knowing God and being in a relationship with Him, and kids can show that peace by being content with the way God is guiding their life without making an unnecessary fuss. 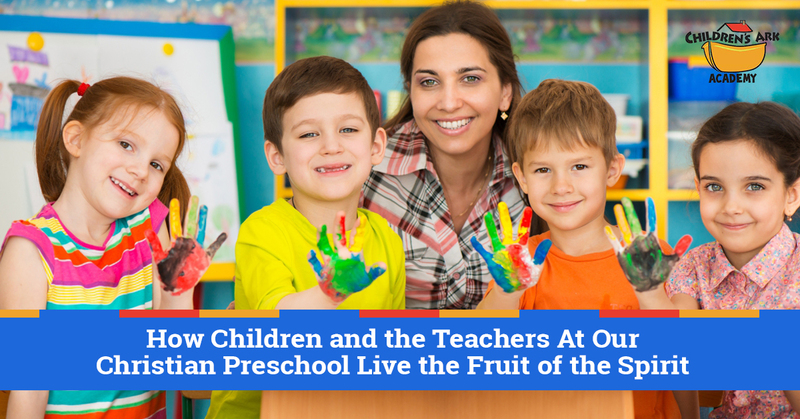 How Instructors Show It: You won’t be surprised to know that it takes quite a bit of patience to deal with preschoolers, toddlers, and babies all day! We always do our best to show kids how to be patient, whether that means forgiving them or talking them through their problem. We know that simply showing patience to the children goes a long way toward influencing how they will react with others. How Kids Show It: First of all, there’s the kind of patience that comes with waiting in line for a snack. There’s also the patience that comes with interacting directly with someone else, such as when another child might be spending too long with a toy. Kids need to learn how important it is to be patient and love one another even if we get angry with someone. Teaching a child patience and peace, as God has shown us by reserving his wrath, can make for a much more pleasant classroom for everyone. How Instructors Show It: Because we’re so aware of our relationship with the kids who come to our Christian daycare, we’re always on guard to show kindness at every turn. We get to know the kids and know how important it is to choose our words carefully and can alter them depending on which child we’re talking to. We also show kindness by welcoming every child we encounter and teaching every child with respect. How Kids Show It: New students are coming into our Christian preschool all the time as parents move to town or become disappointed by secular schools. As these new kids arrive, we always encourage the already-enrolled children to be as kind and welcoming as possible to the new kid. They don’t necessarily have to be best friends with the new child, but they do need to show kindness all the time. Helping everyone out, such as cleaning up, is also an important part of Christian kindness. How Instructors Show It: Goodness can be difficult to define, but let’s take the simple route: we try to do good. We do what we can to take things that are lesser and make them greater. We help to teach kids the difference between what is right and wrong, to head down the path of goodness. How Kids Show It: We want kids to do their best, whether it’s interacting with a fellow student or learning how to count to 100. We’ll remind them that goodness isn’t just in what you do, but in who you are. How Instructors Show It: We are faithful to our calling as teachers of children, doing whatever we can do ensure that they are taught God’s word. How Kids Show It: Faithfulness means staying true to God, the teachers, friends, and parents, even if it would be easier to ignore them and do the wrong thing. In our classes, we stick together! How Instructors Show It: Meekness, not weakness. We are humbled to be able to teach your children and will treat them in a gentle manner. We’ll also guide them in the best possible way to seek the other Fruits of the Spirit. How Kids Show It: There are good ways and there are bad ways to interact with others. Kids can show their gentleness by thinking of others first and approaching situations in a calm fashion. How Instructors Show It: Kids are growing quickly, and controlling their own thoughts and actions can be difficult. We do our best to show our own self-control so that they can see the right way to act. How Kids Show It: We try to instill in kids the idea that some things are good for us, while others are not. Also, even the good things can become bad if self-control is ignored. The Fruit of the Spirit is incredibly important to us here at Children’s Ark Academy, and we do everything we can to teach kids all about them. If you’d like to see it in action, schedule a tour today!